When absentee ballots hit mailboxes next week, the unofficial scoreboard will read…Mitt Romney 25,000, Barack Obama 0. The press fawns regularly over Obama-nation’s ballyhooed ground game. In some ways, deservedly. The Obama ground operation was legendarily effective in this state in 2008. Then again, give any operative $5 million for Get Out The Vote…as was roughly the case here in Colorado in 2010…and you will get a lot of doors knocked. But this advantage in “ground game” ain’t what it used to be. And there is proof…the advantage that Republicans have built over Democrats in boosting the roles of voters who will vote this year via absentee ballot. Absentee ballots are tantamount to votes in the bank. They are easy to chase, and they are bound to get cast. Both parties and their proxies have made it a priority to convert as many voters as possible to absentee voters for these reasons. Now the punchline…Republicans and conservative groups have a real advantage in the number of absentee voters. According to the Secretary of State’s office, Republican and conservative groundforces have banked nearly 25,000 more Republican absentee voters than have their Democratic counterparts. 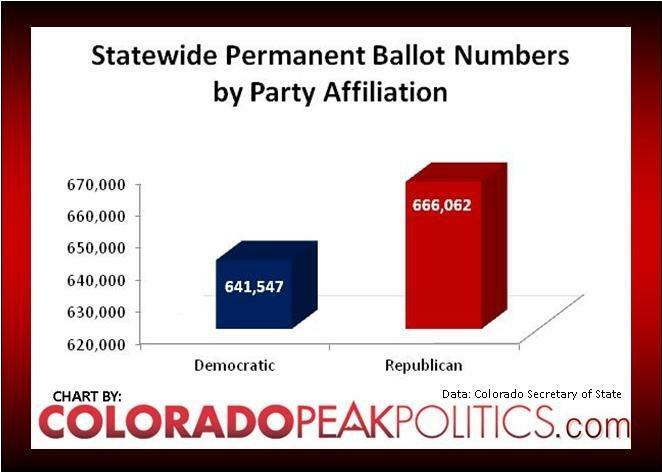 Since most polls show that Republicans are supporting Romney at an equal or higher statistical percentage than Democrats are supporting Obama, this absentee ballot advantage has a very simple meaning: in Colorado, Romney starts with a 25,000 vote head start. Yeah, yeah, yeah…we hear you liberals. This isn’t “game-over”. But it ain’t nothing either. In 2000, George W. Bush lost New Mexico by about 300 votes and more memorably won Florida by about 500 votes. Poor Al Gore. Must have been the altitude. History is full of other examples of presidencies that have been won on a margin equivalent to the width of a credit card. Today, most polls show the race in Colorado at a point or two…call it 25,000 votes. If as expected the race in Colorado tightens and a knife-fight for a vote here and a vote there commences, Republicans and conservatives will be grateful for the head start they have built. When absentee ballots hit mailboxes all across this state next week, the unofficial scoreboard of this critical election will read…Mitt Romney 25,000, Barack Obama 0. Gore Won Florida, the Count was released NY Times 9-12. I can't believe that there are that many people in Colorado that will vote for a man that wants to cut fire fighters after the Colorado wild fires this year. That just goes against all common sense. I am one of the Obama voters who is getting out the vote. We will win CO. We also spell correctly and have good grammer. Good by Obama and all of his Liers. To include the lying cheating Clinton's. My wife and I are one of the 25,000. I am one of the 25,000. "Poor Al Gore. Must have been the altitude." HAHAHA Awesome… From Georgia here, proud to be a RED STATE!